There's an old school of thought among cheddar scholars - the older, the better. We are proud to offer a rare, limited edition classic, Old School Cheddar. This beauty has been left to age undisturbed in our library of select cheddars for four years. "Old School" is exactly what this cheese is - textbook cheddar crafted the old-fashioned way. The result is some of the finest cheese the farmers' of Cabot Creamery have ever offered. This cheese is a 2 lb brick and is not waxed. 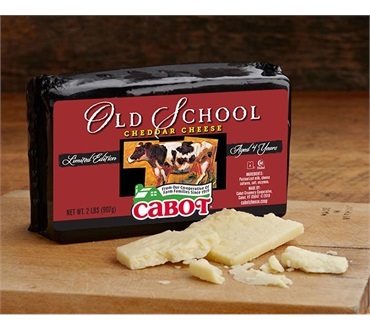 Cabot 4 Year Old School Cheddar 2 Lb. I will triple my order the next time it is available! I never liked cheese. Not until I went to Vermont and had free samples! I am now hooked on Cabot! Travel to Vermont from eastern Long Island in the Spring and Fall to stock up, we usually spend over $400 each time just on cheese. The 5 year was the best, but I will settle for the 4 year. Old School and Vintage Choice are excellent for cooking too. Love when I can mix what ever is left in the fridge for an old fashioned mac n cheese dinner. Friends and family look forward to my Cabot dishes. Oh, did I mention they are all great with a nice hot slice of homemade apple pie? I continue to splurge on this cheese over and over again. Best cheddar cheese ever ... if you like sharp cheedar. Great with sliced apples. Or in Mac & Cheese. While on a bus trip this October we stopped at Cobat's. We love sharp cheddar cheese so we just had to try your cheddar aged 4 years.. We'll be buying more soon.